The hunt for October is now in full swing and playoff races all across the MLB landscape are heating up. With many playoff spots still available and the top teams remaining dominant, the playoff race is among the most competitive it’s been in years. With the Dodgers, Indians, Nationals, and Astros leading as the favorites to win the World Series this year, many of the other races for the remaining spots have taken up most of the media coverage. The race between the bitter rivals Boston Red Sox and New York Yankees for AL East supremacy will come down to the wire. Boston has been trying to hold off the surging Yankees for months and currently hold a three game lead over their division rivals. However, with the Yankees pitching staff and bullpen coming together with the additions of Sonny Gray, David Robertson, and Tommy Kahnle and the stellar addition of third basemen Todd Frazier, they looked primed and ready for a deep postseason run. The Red Sox will remain reliant on stars Mookie Betts and Dustin Pedroia and rookie sensation Andrew Benintendi and ace Chris Sale to fend off the Yankees and make a run of their own. In the National League, the defending World Series champion Chicago Cubs are looking to begin their title defense by first securing the NL Central title. The Cubs with returning stars Anthony Rizzo and Kris Bryant looked like the easy pick to take the division. However, the Milwaukee Brewers are right on their tails and trying to secure their own place in the playoffs this year. While they are still right in the thick of things in the Wild Card race, the Brewers would like nothing more than to take the division and send a statement to the rest of the league. However, while all of these races are tight, it may seem as though it is a four team race for the World Series. With the Dodgers, Indians, Astros, and Nationals all notching over 90 wins this season, it would come as a surprise to no one if one of these four took the title. With the Indians looking to avenge their World Series loss from last year and the Dodgers looking to win their first World Series since 1988, a matchup between the two would make for an ideal ending to the baseball season for most fans. Don’t count out the Nationals and Astros though. With stars like Bryce Harper and Jose Altuve on their teams respectively, you can never count out either team to make a run in October. Their solid team chemistry could come into play and lead either to a championship when all is said and done. 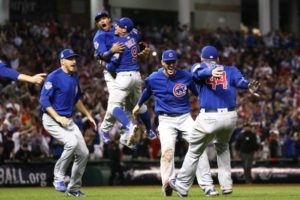 The MLB postseason is upon us and looks primed to be a great time for baseball fans. With such a wide open field and so many great teams, who knows what could happen? We’ll all just have to wait and find out as baseball crowns its newest world champion. Senior Joe Giordano is the managing editor. His email is jgiorda1@fandm.edu.